Having diverse industrial applications, the Sodium Sulphide Yellow Flakes, which we offer is best in terms of quality and price rates. We make sure to use the best quality raw chemicals to produce the Sodium Sulphide Yellow Flakes. We are listed among the prominent Sodium Sulphide Yellow Flake Manufacturers located in Kadapa (Andhra Pradesh). 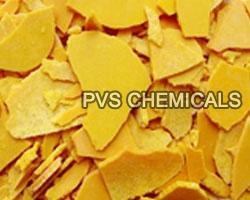 The Sodium Sulphide Yellow Flakes is provided as per the specifications of the customers. We even entertain orders on short notice, as we maintain a large stock at all times. With us, you can be sure of premium quality and best rates in the market.